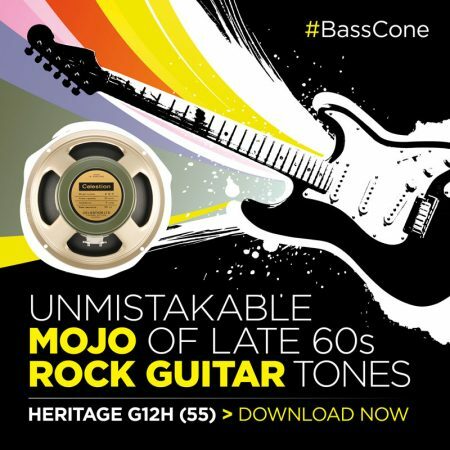 Celestion Heritage G12H (55) IR – Get Your 60s Mojo On! Celestion Heritage G12H (55) Speaker IR – Get Your 60s Mojo On! If you want to add some 1960s rock mojo to your tone, our newest speaker IR is a perfect choice. We’re delighted to announce the release of the Celestion Heritage G12H (55) impulse response, offering you the authentic tones of the speaker that, legend has it, gave voice to much of the work of Jimi Hendrix; ready for instant download from our shop. But for anyone not familiar with this classic speaker, read on to find out more about the history and tonal qualities of the Celestion Heritage G12H (55). While the Celestion G12M, our first ceramic magnet speaker, established itself as a firm favourite among many 60s rock guitarists, the G12H appealed to players looking for a touch more power and a stronger low end, while still being able to deliver controlled and balanced highs – a perfect blend for the heavier rock that was developing towards the end of the decade. At that time, an alternative version of the G12H a conventional ‘lead cone’ version, as well as a variant featuring a cone with a lower, 55Hz resonance frequency, the ‘bass cone’ – intended for use by bass players. However not long after its launch the distinctive tonal balance, with its additional low end also found favour with lead guitarists playing heavier music though 4x12s. Possibly the most illustrious user of this version of the G12H was Jimi Hendrix, who started out using the G12M, but switched to the G12H for its higher power rating and then made full use of its deeper, richer tones, enabling many of his famous solos that slide effortlessly from intense, rumbling lows to searing highs in the space of a few seconds. Hendrix became so closely associated with the G12H that an urban legend arose that the ‘H’ stood for Hendrix. In fact, the ‘H’ refers to the Heavy 50oz magnet. The Celestion Heritage G12H (55) is a modern replica of this iconic 60s speaker, faithfully recreated using authentic materials and construction methods by Celestion in the UK. It’s a distinctive tone that’s found continued appeal for contemporary guitarists, including some of the modern-day greats such as Joe Perry, Aerosmith; Ricky Medlocke of Lynyrd Skynyrd and Blackfoot and Country legend Clint Black. And now, we’ve recreated the tones of the G12H (55) yet again, this time in digital form, as an impulse response. As for all our other speaker IRs, the tones of the Celestion G12H (55) are available in 5 different cabinet options: 1×12 open or closed back, 2×12 open or closed back and 4×12 closed back. Each cabinet has been sampled using 3 of the best-known studio microphones: a Shure SM57, a Royer R-121 ribbon mic, and a Sennheiser MD421, each in 6 positions (plus a rear mic position for the open back cabs). There are also room mic IRs for each cabinet, recorded with a Neumann TLM 107, which can be mixed in as required to adjust the fullness of the overall sound. For a Hendrix-like tone, choose the G12H 55 4×12 cabinet, then opt for Dark or Dark2 mic positions for maximum depth. Alternatively, if you need a tone that cuts through a mix well, try Balanced, Thin or Bright instead. If you’re interested in mixing the G12H (55) IR with other Celestion speakers, you have a wealth of options. It will work well with the G12-65 of course (also from the Heritage family of speakers) and other ceramic magnet speakers in the Celestion range. Some popular combos we’ve seen include pairing it with a Celestion Gold (actually an Alnico speaker) in a 2×12, or in a cross formation with Vintage 30s in a 4×12. Or, why not experiment with a vintage-modern mix and try combining the G12H (55) with, for instance, the Celestion A-Type for some strong American tones, or perhaps our recently released G12K-100 for even more thump. Ready to apply unmistakable 60s mojo to your playing? Get the new G12H (55) Speaker IR here. Buy single cabinet IRs or the complete 5 cabinet collection for a significant discount. Or create your own selection of impulse responses from our range, with a Pick and Mix option. …all on the CelestionUK YouTube channel.